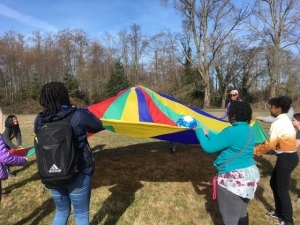 It may be the era of cellphones, video games, and indoor activities, but youth have always thrived being outdoors actively engaged with one another in exploring nature and making up nature-based games of daring and imagination. This year, I am devoting a lot of my time, energy, and passion to supporting that truth. At a most personal, joyful level we just finished a week of Granny Nature Camp with our two dear Los Angeles grandchildren. 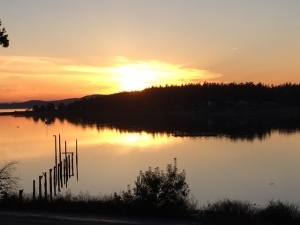 And at a larger community level I am one of the adult volunteers in our local middle school program, which received a No Child Left Inside grant from the Washington State Parks and Recreation department for the 2018-2019 school year. What do we do in our Granny Nature Camp? Education. Fun. Adventure. Storytelling. Listening. 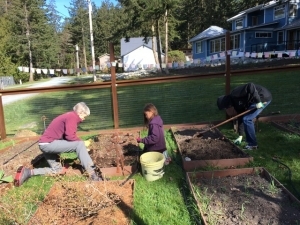 Our first project this year was having our 8 and 14-year-old grandchildren plant pea, kale, and spinach seeds in the garden. Young people need to understand where their food comes from. 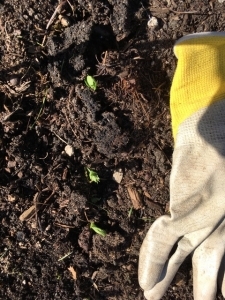 The miracle of spring is that they put those seeds in the ground when they arrived and were able to see them coming up before they headed back home. 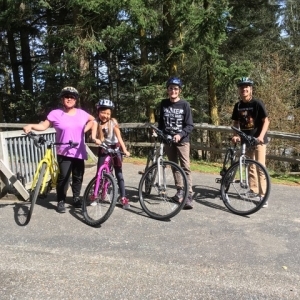 Eight-year-old Sasha learned how to ride a bike during her visit with us last summer (when she was 7). She doesn’t get much of a chance to practice riding where she lives, so we rented bikes and watched her natural athletic abilities take over. Both kids love our little dog who, of course, needs walking outside every day. 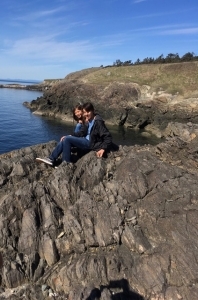 We have some spectacular scenery where we live—cliffs, mountains, the sea. 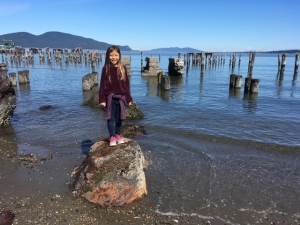 My experience is that kids are not overly impressed with scenery, but they do love immersion in that scenery. 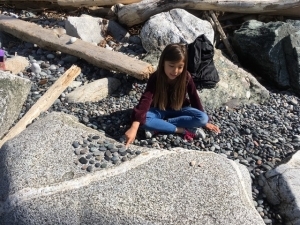 Our kids are physical in their appreciation: the challenge of climbing on rocks, throwing rocks, watching animals, and learning about some of the plants their grannies know. We began each day by drawing animal cards and talking about our plans for the day. Talking and listening are important skills our dear grandchildren have. I will always treasure those spontaneous conversations that spring forth by being in the stimulation of a green growing world with them. March 16thour Middle School hosted the “We the Ecosystem—Creating Community” workshop. 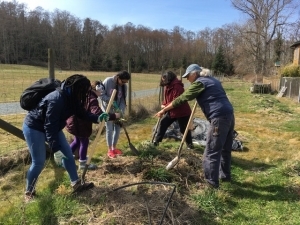 Seattle’s Young Women Empowered (Y-WE) Nature Connections Program came to join us for a day of immersion in nature and community. The Y-WE program serves diverse young women aged 13-24. 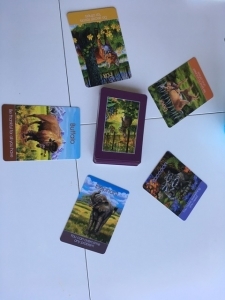 Since we were gathering so close to the spring equinox, March 21, I designed some outdoor games to celebrate and honor the changing of seasons. In the northern hemisphere the spring equinox marks a point where night and day again come into balance—each 12 hours long. The switch from winter to spring, erratic as it often is, is a time worthy of huge celebration. In pausing to notice the signs of spring around us we created a little ceremony—a deliberate noticing, an awakening, something to align our energies with the season. 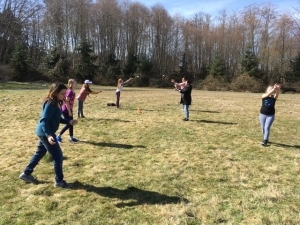 Since several of the girls had spoken about chicken or duck eggs hatching, we transitioned to the next spring celebration: an egg toss. Big learning—eggs are remarkably resilient when they bounce on soft grass and it is not such a good idea to catch an egg in close to your body. Laughter and fun aligned our energies with the rising energies of the soil beneath our feet. Another team worked to transform an ignored garden bed behind the school. Overgrown with grasses and weeds, the twenty-foot long bed appeared an impossible task for a short activity period. Dozens of girls with shovels and good instruction went to work. An hour later the bed was ready for the next shift of girls to plant cold weather seeds like radish, spinach and peas. Spring in the northern hemisphere signals the beginning of our “agricultural year”. It important for all of us to understand and appreciate where our food comes from and how it grows. 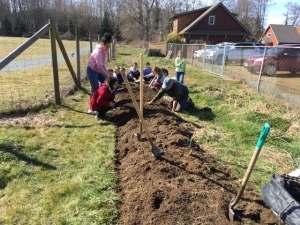 Under the direction of the schools gardening director, Cary Peterson, girls tackle the difficult task of turning over an overgrown garden bed. One hour later and the 20-foot garden bed was ready to plant peas and radishes. 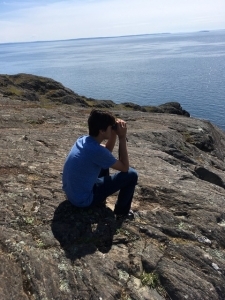 For me the most basic fact of planetary survival is to raise young people who love, care for, and understand the earth they live on. They don’t have to go on exotic trips or live in what might be defined as a beautiful natural place. They simply need help going outside and learning about the part of the planet right under their feet. No Child Left Inside is a tall order, but it is something we who have our own child-in-nature memories can make happen with grandchildren, school children and neighborhood children. “NO CHILD LEFT INSIDE” – What a great title for this grant! That sounds right up your alley, too, for being the expert teacher, Ann! Thanks for sharing your love and passion for the “outside”. It has enriched my life and brought deeper meaning – I know that I am one in a million who could say that. Great story to start my day!! How do I sign up for this camp, I wanna come? When is it, what is the cost, besides lots of hugs. I’m a good cook! This is such important work! Kudos for all who are doing it! You and Christina are the most inspiring people I know. You enrich my life, and that of all those around you. Your sharing of experiences ensures that this legacy of caring for earth and storytelling will go on through your readers. Camp Gigi will not be quite what I would have chosen for this year, as the camp-experienced five year old would be of an age to really dive into exploration of Three of Earth Farm, but the three year old will be joining us while the moms are on the other side of the pond. The adventure will be changed, but hopefully I can get them into the garden and the woods to see what we can find. And we will write down the story on hearts…and paper maybe! Love to you, dear Ann. Thank you. Such a lasting gift you share with your grandchildren and also with other kids. And what beautiful kids! Hard to believe that Jaden is already 14! Having had our precious 22 month old grandson with us for five days was such a gift. I watched his little feet almost dance over the grass as he ran to Grampa to help with his many outdoor projects. With great excitement, he pointed out every bird-o he saw. the little feeder goldfish in the pond. Deer eating in the yard, raindrops falling on the pond, rabbits hoping around the yard were all reasons to express his great joy in the nature that surrounds us. It was a delight for us to share in his delight.